Access mode: the Internet portal of the Presidential Library. The title from the screen. Electronic reproduction of the postcard: Clear glade. 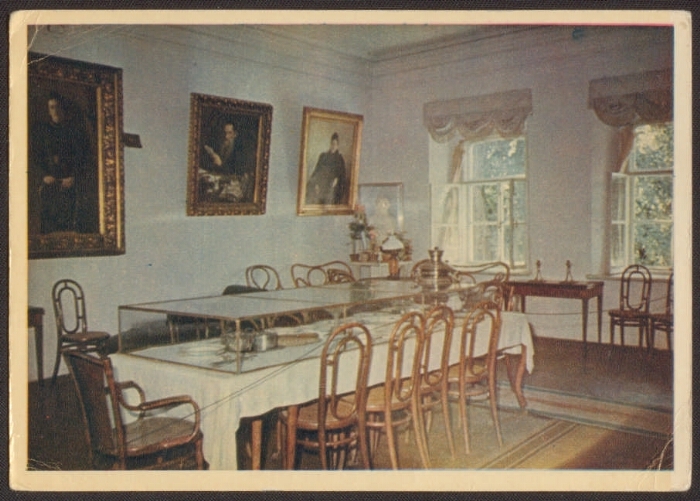 Dining room in the House-Museum of Leo Tolstoy [Izomaterial] / photo L. Borodulina. True, 1956 (Order of Lenin printing house of the newspaper "Pravda"). 1 card: color offset. On the reverse side of the stamp. The circulation is 150,000 copies. Sh 10867. The price is 20 kopecks. Location: Children's Memorial Museum, St. Petersburg. Copying by users is not allowed. I. Borodulin, Lev Abramovich (photographer, 1923-). II. "Yasnaya Polyana", the museum-estate of Leo Tolstoy. State Museum of Leo Tolstoy "Yasnaya Polyana", State Memorial and Nature Reserve - Postcards 2. Postcards in the Presidential Library Fund (collection) 3. Territory (collection) 4. Russian language (collection). Russia in faces (collection) 6. LN Tolstoy (collection) 7. 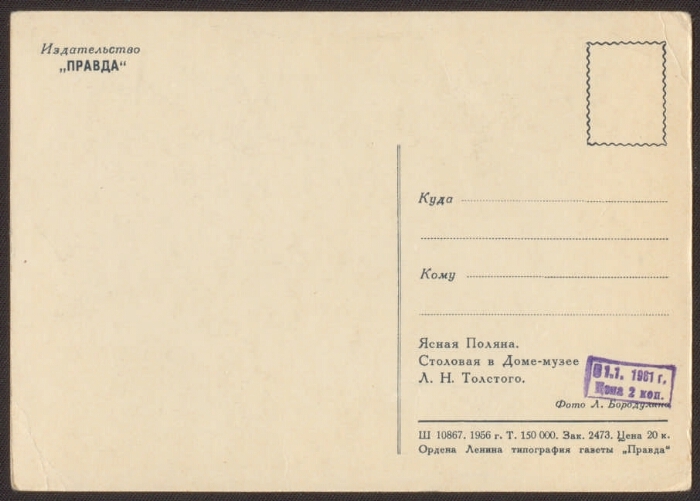 Documentary postcards - USSR - 1945-1991.